Spider-man went to tea at the Elysée. Spider-man of Paris to get French citizenship after child-rescue. Then he goes and saves a life on Youtube. Now, he's being fêted as a symbol of "volonté" (will) which Macron (president of France) claims is foundational to "French identity". Now, he's being employed by the fire-fighters of Paris, to save lives. Spider-Man, a photo opportunity gift from God, to President Macron. Members of the Front national, self-proclaimed "protectors" of "French identity" are raging against the announcement that Mamadou Gassama, will be rewarded with French citizenship. Saving lives means nothing to them. What will happen to his brother and other partners in precarity? 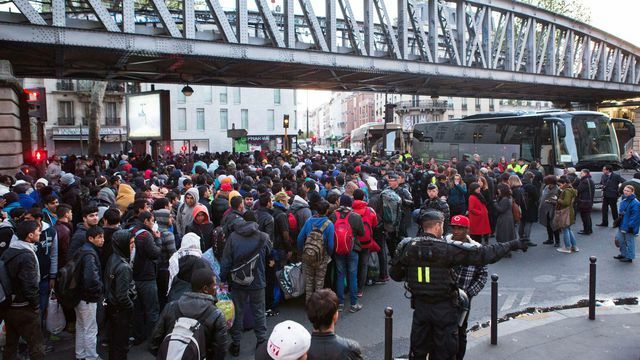 Buses came to gather up "clandestines" "lodged" in tented cities in Paris just this morning. Mirage-Man went to tea at the Elysée...often...but now he's dead. Le mort de Serge Dassault, un grand industriel français. One moment, he's being sued in court for tax fraud and being threatened with a jail term. Next moment, he's being fêted by the Elysée. Death is great for tax-evasion! Death is great for business! Rafales, over Mali (that's in Africa). Rafale M: €79M (flyaway cost, FY2011) The Dassault Rafale (French pronunciation: ​[ʁafal], literally meaning "gust of wind", and "burst of fire" in a more military sense) is a French twin-engine, canard delta wing, multirole fighter aircraft designed and built by Dassault Aviation. Burst of fire on the ground in Mali. Dassault, a symbol of "volonté" (will), of French "air-superiority" of overseas projection. The French are in Mali "to help destroy jihadists" aren't they? Mali... but that's in Africa, isn't it? Aren't the French in Mali for other business? Mali: When France ruled West Africa. I went back and read a post from December 2016 entitled "The end of the world". I had forgotten that Abba had already educated me on French interests in Mali. One of them, Abba, from Bamako, Mali, was busy educating his friends on global politics and colonialism. "There aren't many uranium mines in the Massif Central." "'What do you think the French army is doing in Mali?" "Have you heard of Areva?" "Did you hear that they have found oil in Senegal?" "For it has always been the law that the weaker should be subject to the stronger." From pg 43 of "The Landmark Thucydides" history of The Peloponnesian War", written more than 2500 years ago. Just because it was, and has always been, does it always have to remain that way in the future? No, where there’s life there’s hope Daniel.